This chair is standard with fabric or leather upholstery with 4" foam. 100% Amish hand crafted with quality hardwood. Many add on features are available for this chair. We start out with the basic chair and let you choose your upgrades. Please contact us if you would like to provide your own fabric. 100% Amish hand crafted with quality hardwood. This chair is standard with a wood seat, but fabric and leather is available. 100% Amish hand crafted with quality hardwood. This rocker comes with a wood seat, or upholstered with fabric or leather. 100% Amish hand crafted with quality hardwood. Put your feet up at the end of a long day with this comfortable glider. The bow arms work with the gliding chair to double your comfort. You can rely on this sturdy glider to let you relax. Ottoman can also be purchased separately from the chair. The glider has mortise and tenon joints which ensure long lasting durability. You can provide your own upholstery fabric if you'd like to have this piece match your living room. Customize the finish and fabric so it matches your home (shown top right). After a long day, you can just glide away on this glider. The slatted glider has bowed arms and comes with a matching ottoman glider to keep your whole body comfortable. Heirloom frames on both pieces support plush cushions. This piece comes standard with the ottoman, but can be purchased without. Ottoman can also be purchased separately from the chair. Frames feature mortise and tenon construction for long lasting durability. Contact us if you would like to provide your own upholstery material. Bowed shaping is a star on this comfortable rocker. The arm rests are just right for your arms. 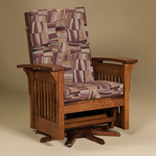 The solid rocker frame will keep you rocking for a long time, while slats complete the hard wood style. The Bow Arm Panel Rocker is also available which features side panels rather than slats. Contact us if you would like to provide your own upholstery material. Frames feature mortise and tenon construction for long lasting durability. A glider is a great spot to relax after a hard day's work. This sturdy glider has the convenience of a swivel base so you won't even have to turn your head to look around. The Panel Glider Swivel is also available which features side panels rather than slats. Contact us if you would like to provide your own upholstery material. Frames feature mortise and tenon construction for long lasting durability. Add the Slat Ottoman to your glider for additional style and comfort. The pictured Fireside Rustic Baby Bear Rocker is built in white cedar with natural finish. 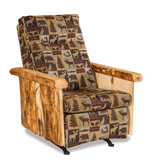 The pictured Fireside Rustic Mama Bear Rocker is built in white cedar with natural finish. Pictured in aspen with Natural Finish and Erie Fabric. 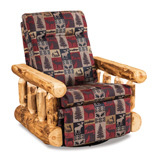 The pictured Fireside Rustic Papa Bear Rocker is built in white cedar with natural finish. 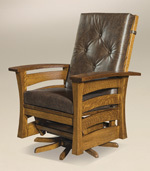 The pictured Fireside Rustic Rocker Recliner is built in aspen with natural finish and Mealey Fabric. 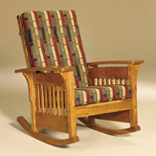 Shop our selection of Amish rocking chairs and gliders for sale to find the right style for your home.